I have some really exciting news to share. As of this week, I was officially named a Sweaty Betty Ambassador, representing the Wimbledon Village boutique. 6 months ago, I was actually working for Sweaty Betty as their in-house copywriter, so this is a brand I’ve grown to love from the inside out. I laboured over the precise tone of key marketing campaigns, slogans to display in-store, and even the brand poem that would come to promote the Sweaty Betty lifestyle (see below). I studied every stitch of the products in order to capture their essence and summarise all their amazing benefits for in-store and online shoppers. And I made the painstaking decision to leave Sweaty Betty headquarters only because my passion for teaching took me increasingly away from my desk. Fortunately, the separation was only temporary. As Sweaty Betty Ambassador, I now get to continue my love affair with the iconic British brand’s incredible twice-annual collections. The next season – AW16 – is called Fire and Ice and is inspired by the dramatic landscapes of Iceland. As always, it is totally different from what has come before and I cannot wait to incorporate some of my favourite pieces in my ever-expanding workout wardrobe. Until then, I just want to share a few of the reasons the role of Sweaty Betty Ambassador means so much for me. Many people think the ‘Fit Brit’ in my brand refers to me. It actually refers to YOU – my fitness family. It refers to all the people who live in Britain or look up to the UK’s inspiring and burgeoning fitness scene. As a Collective, FBC is a brand that is defined by the people who join me for personal training, bootcamps, classes and events. That means your energy, your humour, your style and your goals are at the heart of the brand. I’ll give you the workouts, the ebooks and the advice to support your fitness journey, but only you can own that journey and create outcomes that make you proud. Similarly, Sweaty Betty’s collections are so customisable, with tops that you can layer just as you like, leggings you can reverse according to your mood and the coolest Sports Luxe pieces that lend themselves to infinite styling. Sweaty Betty provides the pieces, but its customers create the look and bring it to life by the way they wear them and what they achieve while they’re all geared up. We’re both ever-evolving brands, created for and defined by the community. I can think of no activewear brand that makes a better fit for FBC! Creativity is at the heart of my personal and group training services. I literally spend every commute and spare minute thinking about new exercises and new ways to put classic exercises together for bigger, better results. Likewise, Sweaty Betty has some trademark features – like their exceptional fabrics and show-stopping prints – but every season they add new twists and updates so each collection feels like a dramatic evolution of what came before. While I love to keep the body guessing, Sweaty Betty innovates by giving us year-round fashion inspiration and adding serious impact to our workout wardrobes. I used to work closely with Sweaty Betty founder Tamara Hill-Norton when working in her head offices, and she continues to be someone I respect and idolise a great deal. Her initial inspiration for launching Sweaty Betty was to create a retail haven that embraced, enabled and celebrated women who participate in every kind of activity. You can shop for ski wear alongside yoga wear; find the perfect outfit for marathon training or a kickass bikini for playing beach volleyball on holiday. Although there is a slight tendency in the industry to lean towards aesthetics-based training, I love how Sweaty Betty holds true to its celebration of all movement and finds joy in movement itself. It’s not all about how you look or the results a particular style of exercise can deliver – it’s also about loving the exercise in the moment and the way it makes us feel. As well as on-point customer messaging, Sweaty Betty’s immediate team of designers, marketing professionals, retail staff – plus of course their now global team of ambassadors – are collectively some of the most inspiring people with whom I’ve had the good fortune to work. In a highly competitive world, Sweaty Betty manages to lift up every individual in the pursuit of collective success. I’m already looking forward to some incredible Sweaty Betty and Fit Brit Collective collaborations, and to working together with my fellow ambassadors on Sweaty Betty’s famous Get Fit 4 Free campaigns. With mutual love and support, the world of women in sport and fitness can only become more positive, welcoming and progressive. That’s a chain reaction I can happily get behind! Insane shoot locations naturally elevate Sweaty Betty from a lot of other activewear brands, but the brand’s spirit of adventure is both internal and external. Models in the past have been dared to hold headstands on paddleboards – sometimes successfully, sometimes not. (The hair and makeup teams work exceptionally hard!). 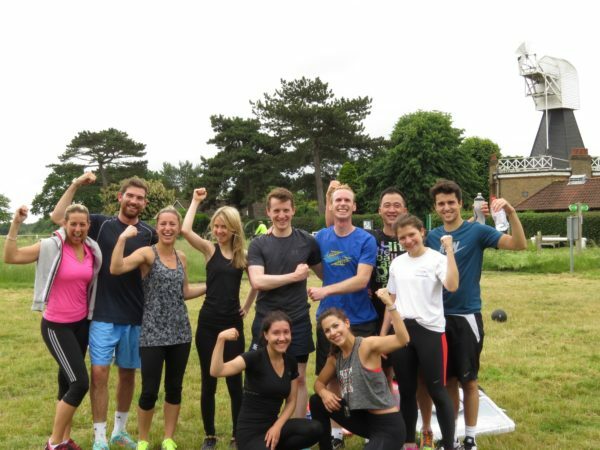 The teams organising Sweaty Betty events and campaigns are continually pushing themselves out of their comfort zones and leading by example by taking chances. There is a collective sense of ‘Why not?’ inherent to the brand and the community drawn to Sweaty Betty. And as I begin this new adventure as Sweaty Betty Ambassador, I look forward the many other thrills and discoveries around the corner. After all, we’re all in it together.